Easter is a fun time of year filled with spending time with family and pets, warm spring weather, Easter egg hunts and of course chocolate. But for our pets, there are lots of hazards around which could turn a lovely day into an emergency trip to the vet very quickly. To help prevent this, we’ve outlined some things to look out for below. Chocolate is usually in abundance in most households when Easter springs around! So our pets (particularly greedy and sweet-toothed dogs) are more likely to have the chance to hoover up sweet treats, especially if they’re left around on low surfaces or on the floor. Although harmless to us (apart from to our waistline) chocolate can make dogs very poorly and can even be fatal. This is due to a toxin called Theobromine, a chemical found in the plants used in chocolate manufacture. Humans are able to break down Theobromine quickly enough for it not to act as a poison. However, dogs metabolise the chemical much slower, meaning it can have detrimental effects. Symptoms of Theobromine poisoning include: muscle stiffness, tremors, vomiting, heart arrhythmias and fitting. The poison can take between 4 – 24 hours for signs to appear. 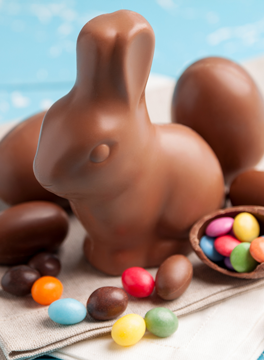 Although chocolate is also bad for cats and rabbits, they’re less likely to eat it as they can’t taste the sweetness. If you think your pet has eaten chocolate, we’d recommend you take them to your vet immediately. If you spot any of these, contact your vet ASAP. Easter baskets are a lovely gift idea and are great for kids as you can put small toys and other treats in there. Unfortunately, problems happen when pets want to get involved in the fun too! Small toys and filler material like straw and plastic grass (very appealing to cats as it’s fun to play with!) are easily swallowed by pets. This is likely to cause digestive obstruction, which can lead to expensive surgery! Symptoms of digestive obstruction include: persistent vomiting, bloating, weight loss, weakness and dehydration. If you think your pet has swallowed an Easter basket item, get in contact with your vet as soon as possible. We all love a hot cross bun over Easter, especially smothered in butter! However, this is also a treat that we can’t share with our fluffy members of the family. This is because they contain raisins and other dried fruits, which cause kidney failure in both dogs and cats. Kidney failure classically causes increased thirst and urination; however symptoms are usually seen weeks later when the secondary effects of reduced kidney function kick in. In the days following ingestion there are usually no clinical signs at all. A tasty roast dinner is one of the best parts of Easter Sunday (not including the chocolate of course!). It may be tempting to share some of your roast with your pet; they’re part of the family too right? But giving them scraps of fatty roast pork or ham can allow for a whole host of problems, such as bloating, abdominal pain, vomiting, loss of appetite, lethargy, dehydration, fever and in more serious cases pancreatitis. So if you want to treat your pet at dinner time, a couple of their favourite pet treats will be a much healthier option – we promise they’ll enjoy them just as much! An Easter egg hunt around the garden on Easter morning is really good fun and certainly tires the kids out for the rest of the day! However, once they’ve found all they can and given up due to your expert hiding skills, make sure to gather up all the remaining eggs before you let your dog out (top tip: make a list so you know where you hid them!). With their amazing noses, your dog will be able to find any missed eggs and gobble them up given half a chance. Even if you use plastic or boiled eggs instead of chocolate, these still won’t do your dog any good. Plastic eggs can cause digestive blockages and boiled or raw eggs are not the best for your dog due to the risk of Salmonella, the sharp shell and they can cause digestive issues. So our advice to all you cat owners out there would be to avoid having lilies in the house altogether. Of course, we know friends and family like to give them as gifts, but sometimes it’s better to just politely decline. We’re sure they’d understand that you want to keep your moggy friend safe. You know what they say, it’s better to be safe than sorry! You know it’s spring when the daffodils start popping up! But unfortunately they’re poisonous to dogs if they decide to take a chomp out of one! Dogs can suffer from vomiting, lethargy and even fits if they eat the bulb, flower or if you pick some for the house, the water they sit in. Another pretty bulb plant which doesn’t do pets any good! The exposed bulb is the most dangerous part if your pet eats it, but they can suffer from drooling, tummy pain, vomiting and sometimes breathing issues and sudden drops in blood pressure if they eat any part of the plant. The beautiful, bright coloured tulip is lovely, but it can irritate your dog’s mouth and their gastrointestinal tract. If eaten, it can also cause drooling, diarrhoea and vomiting. Other, more severe, symptoms also include difficulty breathing and heart problems. Sadly, the majority of toxins listed won’t show symptoms until the damage is already done and at which point it is not reversible (especially raisins and lilies which effect the kidney). A lot more can be done in the first 4 hours to save your pet, than when they start showing signs of being unwell. If you think your pet has eaten any of the above, it’s important you get in contact with your vet ASAP and give them as much detail as possible. As always, if you’re unsure if your pet can eat something, we’d always recommend sticking to their regular pet food to avoid poorly pets and emergency trips to the vets. Keeping food off the floor and lower surfaces is the best way to avoid your pet nibbling on a tasty treat! We’d also recommend keeping food in high up cupboards, so Fido and Whiskers can’t sneakily help themselves to something! We hope you and your pets enjoy the Easter weekend and have a great (and safe) time.